OEP | More heat, less steam! OXFORD’S Westgate shopping centre will get a revamp but it is likely to be a scaled back version of previous plans. The Crown Estate and Land Securities Group PLC consortium is discussing a new scheme and will meet Oxford City Council planning chiefs next week. The Oxford Mail understands it will be smaller than the £330m scheme agreed in 2006 for a mall, garden building, market building and John Lewis store, because of the economic downturn. The regeneration of the site, which stretches from Queen Street to Oxpens Road, is seen as a major catalyst for economic growth in the city. And its importance has grown in recent months with news that a proposed retail development in St Aldate’s has fallen by the wayside. The Carlyle Group last month withdrew its plan for a £22m open air shopping centre between St Aldate’s Tavern archway and Queen Street. The Westgate consortium has been conducting a feasibility study into options and will meet the city council on February 21 to discuss revised options and timescales. The council, which owns land that part of the extension could be built on, will have the final say. Colin Cook, the councillor responsible for city development, said Oxford could still pull in major projects but he expected a smaller plan for the Westgate, which opened in 1972. He said: “Realistically, I am not expecting [the developers] to do something on the same scale as what went previously, but I hope they will aspire to something close to that size. Oxfordshire Economic Partnership director David Doughty said the project was vital for the city. Graham Jones, spokesman for traders’ group Rox, said: “It would create renewed interest from shoppers both in Oxford and across the area. The redevelopment was first mooted in 1999 and planning permission was renewed in November, although councillors expected a redesign. Each year, Oxfordshire Economic Partnership brings together the leading business people from across the county for a formal dinner to recognise the achievements of our partners in creating a stronger economy for Oxfordshire. 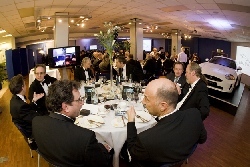 Unipart Group, one of Europe’s largest independent logistics and consultancy companies, sponsored the event which was held in the restaurant at the company global headquarters in Oxford. 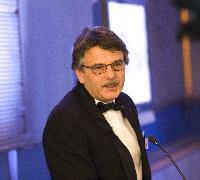 Guest speaker for the evening was Dr. Ralf Speth, chief executive of Jaguar Land Rover. Dr. Speth has over 22 years experience in the European auto industry, including senior roles at BMW, the Premier Automotive Group of Ford Ltd and Linde Group. At the dinner, he championed the role of UK manufacturing and stressed the importance of aligning research and development between universities and high value manufacturing companies. 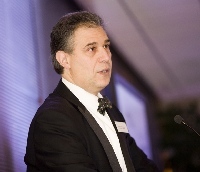 In welcoming guests, OEP Chairman Frank Nigriello said that OEP has a critical place in Oxfordshire in representing the voice of business bringing together organisations like the Institute of Directors, the Federation of Small Business, Oxfordshire Town Chambers Network and many others. “In the last two years under David Doughty’s leadership as chief executive, OEP has brought business people together to step in when our local authorities struggled to get things off the ground,” he said. “The Innovation and Growth Team, for instance, was brought together by OEP as was the county’s Learning and Skills Partnership. “And in the midst of recession, we organised Job Clubs to help those recently redundant — and worked with local bank directors to get the best advice and help for businesses. “We brought together mentoring organisations with support from NGAGE and introduced Fredrick’s Fund to help small businesses facing financial difficulty. “We took the issue of skills head on by working with Oxford University and local businesses to create an Oxfordshire workplace learning model and – working with Oxford Brookes – we ran a massive skills research project that spanned the entire county. “We’ve also engaged with the health industry in two projects – one locally for the Thames Valley and one as part of a European cluster – looking at health care innovation. “OEP also ran a series of events including Skillsfest, nearly 20 Horizons and Futures seminars and the Digital Summit in September, at which Ed Vaizey, the minister for communication culture and the creative industries, helped us launch a campaign to get superfast broadband and better mobile telecoms in the county. OXFORDSHIRE has won the battle to have its own standalone ‘Local Enterprise Partnership (LEP)’, which will replace the South East England Development Agency Seeda by 2012. Council leader Keith Mitchell masterminded the successful bid for an Oxfordshire ‘City Region’ enterprise partnership with boundaries following those of the county. He said: “It was against the odds because the Government thought these things ought to be across county boundaries, but we had the support from businesses and all the district councils, plus the two universities.” The chief executives of BMW and Oxford Instruments also backed the bid, he said. Iain Nicholson, a director of the Oxfordshire Town Chambers Network, said: “After years being seen in government as part of Milton Keynes, Oxfordshire and Buckinghamshire or the Thames Valley, this is a brilliant opportunity for Oxfordshire business to help shape its own destiny. West Berkshire District Council had wanted to form a Thames Valley LEP consisting of Oxfordshire, Berkshire, Buckinghamshire (except Aylesbury), Swindon and the M4 corridor, but the Government has approved a Thames Valley Berkshire LEP and a separate Oxfordshire one, leaving holes in the map for Buckinghamshire and around Woking. Failed bidders are being advised on how to submit fresh plans. Government ministers say LEPs will “transform the economic geography of the country”. They want to see equal representation of business and council leaders. Oxfordshire was one of 24 local enterprise partnerships given the green light this week. Business secretary Vince Cable confirmed that the emerging council and business-led local enterprise partnerships will receive no funding for administration costs from the Government. However, there will be a £1.4bn Regional Growth Fund, The abolition of Seeda by March 2012 is expected to cause 90 job losses, and will have a knock-on effect as economic growth projects lose funding. Its budget for 2010/11 was £120m, including nearly £40m of EU funding. The Oxfordshire Economic Partnership (OEP) will no longer be funded by the county council, but chief executive David Doughty said the organisation would continue, backed by a core membership of about 30 firms. He said: “I still think the OEP has a role in representing business. There are so many businesses in the county and they can’t all sit round the table with the LEP. Mr Mitchell, who is on Seeda’s board, said support for farmers was likely to suffer next year, but he hoped that rural broadband pilots previously supported by Seeda could be taken up by local business partnerships. He added that Seeda had been very good at promoting the South East to foreign investors and companies wanting to move in — a role due to be taken over by the Government. OXFORDSHIRE’S ‘digital future’ will come under the spotlight this weekend at a conference called OxOnline 2010: Connecting Oxfordshire. The Euro MEP for the South-East Region, James Elles, will join communication minister and Wantage MP Ed Vaizey on Saturday for the event at the Culham Conference Centre, organised by Oxfordshire Economic Partnership (OEP). According to experts, only about a third of the county has a better than 50 per cent chance of receiving the next generation ADSL by 2015 — and rural areas more than five miles from a BT exchange are most likely to be ignored. At present, mobile signals often fail only a few miles from Oxford city centre, and broadband is “patchy” at best in many areas, according to Mr Doughty. To book a place at the conference, email d.doughty@oep.org.uk. COUNCIL leaders are battling it out over who should control the new Local Enterprise Partnerships (LEPs) — which the Government would like to see replacing Regional Development Agencies. The deadline for bids to form LEPs was last week. Now business secretary Vince Cable and Communities and Local Government secretary Eric Pickles must ponder three proposals covering Oxfordshire. Oxfordshire County Council leader Keith Mitchell wants to form a so-called Oxfordshire City Region Enterprise Partnership with boundaries following those of the county. West Berkshire District Council wants to form a Thames Valley LEP consisting of Oxfordshire, Berkshire, Buckinghamshire (except Aylesbury), Swindon and the M4 corridor, while Cherwell District Council wants to join a South East Midlands partnership as well as Oxfordshire’s. Under Government plans, eight Regional Development Agencies (RDAs), including the South East Area Development Agency (Seeda) of which Oxfordshire is part, are to be replaced with LEPs by 2012.
Business groups like the Confederation of British Industry, the Institute of Directors and the Engineering Employers Federation fear many of the proposed LEPs will be too small, but Oxfordshire County Council leader Keith Mitchell said: “There is strong evidence that Oxfordshire’s boundaries correspond closely to a functional economic area which is what LEPs are about. We have the support of our Oxfordshire MPs. 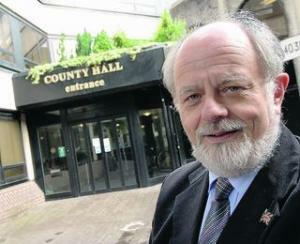 A statement from Cherwell District Council said it was not yet clear whether councils could be a member of two. Christina Howell, of the Thames Valley Chamber of Commerce, said that because the Government had set such a short timescale, the chamber had simply presented a proposal for the Thames Valley as a consultation document. The fight is on for Oxfordshire to be recognised by central government as a stand-alone, single, viable economic area rather than part of a larger development region — according to the leader of the county council, Keith Mitchell. A joint letter sent to council and business leaders from business secretary Vince Cable and communities secretary Eric Pickles has invited them to form new Local Enterprise Partnerships (LEPs) to replace Regional Development Agencies such as the South East Economic Development Agency (Seeda) — which is set to be abolished. The thinking is that LEPs should represent identifiable “natural economic areas” — which would typically be larger than single counties — but Mr Mitchell is intending to ‘pitch’ Oxfordshire as an exceptional entity which should be allowed its own unique organisation to monitor the transfer of economic power from the public to private sector in the coming years. He told The Oxford Times: “A fortnight ago, we called a meeting of representatives from 100 of the county’s top companies and we decided to put in a bid before the end of August for Oxfordshire to have its own Local Enterprise Partnership. “We felt we could show that Oxfordshire is an identifiable, economically functional area in its own right “We have the best university in Europe here, and a top modern university too — and we have the backing of both vice-chancellors. Deputy prime minister Nick Clegg last month announced a £1bn Regional Growth Fund to help areas and regions particularly at risk from public spending cuts, but Mr Mitchell said he expected most of that money to go to areas in the north of England. As a result, he reckons the county council would probably have to pick up the bill for the new LEP and he would not expect the private companies involved to pay. But he expected the annual bill to be comparatively small, perhaps £150,000. Legislation to set up LEPs will be included in the Devolution and Localism Bill, scheduled to be introduced to Parliament in the autumn. Meanwhile, it is expected that at least half the members of the boards will be composed of local business, with the other half coming from local authorities. The partnership boards will be chaired by a prominent local business person from the private sector. But what real power will the new partnerships have, and how will they differ from the old regional development boards? David Doughty, Chief Executive of the present Oxfordshire Economic Partnership (OEP) — funded at least until October by Seeda and the county council — listed among their roles: rebalancing the economy towards the private sector; tackling issues such as planning and housing, local transport and infrastructure and small business priorities. A stand-alone Oxfordshire LEP would restore to Oxfordshire people the ability to administer European Regional Development Funds, which are currently administered by Seeda. Now a not-so-polite tussle has developed between Messrs Doughty and Mitchell over the future of the Oxfordshire Economic Partnership. He added that in any case employers’ organisations were coming out against the idea of a stand-alone Oxfordshire LEP. Mr Doughty said the Thames Valley Chamber of Commerce favoured a Thames Valley LEP — a collaboration with neighbouring counties. He added that the OEP would continue to exist as long as its members wanted it to do so. Meanwhile, Mr Mitchell is hoping that the fact that Prime Minister David Cameron was a local MP could be helpful. He said: “It’s cheeky perhaps, but we have the ears of Government here, helping us to punch above our weight. A £22m shopping precinct in the city centre is under threat following the collapse of talks with Oxford City Council. The global equity firm, the Carlyle Group, submitted plans to create a new open-air shopping centre running from St Aldates Tavern archway to Queen Street, near the Marks & Spencer store. The company said it was ready to defy tough market conditions to regenerate a neglected part of the city centre, creating new shops, offices, student accommodation and jobs. But The Oxford Times can today reveal that a question mark hangs over the whole scheme because agreement cannot be reached with the city council over how much the Carlyle Group should pay into Town Hall coffers under a planning agreement. The so-called section 106 agreements are legally binding and oblige landowners and developers to contribute to council works and services. Business leaders warned failure to reach agreement could see the city lose a major opportunity to redevelop the site. Carlyle submitted a planning application in 2008, with plans for nine shops, 17,000 sq ft of office space and accommodation for up to 96 students above the retail units. But nearly two years on, the application has still not been considered. A Town Hall spokesman said: “The scheme at St Aldates and Queen Street would require a significant section 106 contribution from the applicant. Mark Harris, head of UK asset management for Carlyle, said: “We are very disappointed that we have not been able to come to an agreement with Oxford City Council with regard to the section 106 at our St Aldates scheme. “During a time of significant economic uncertainty, we presented them with a viable scheme, which is compliant with current adopted policy in relation to section 106. But Mr Harris said he remained hopeful the scheme could still go ahead. He said it would be negligent of the council if it did not receive a “satisfactory” level of funding for infrastructure costs. The section 106 money would go towards funding the West End infrastructure, such as Frideswide Square improvements. Large areas of the site of the proposed development are owned by Merton College. Much of the site has been acquired by the Carlyle Group on a 135-year lease. Part of the land, which is used as a private car park, is owned by the city council. Work would have involved an eight-month refurbishment of existing buildings in St Aldates and later the demolition of the city council offices at St Aldates. You are currently browsing the archives for the OEP category.